What Is Palynology? 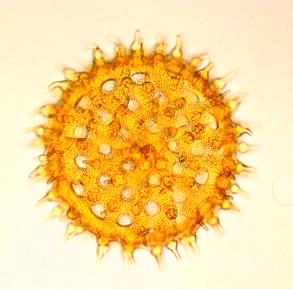 Palynology is the study of plant pollen, spores and certain microscopic plankton organisms (collectively termed palynomorphs) in both living and fossil form. 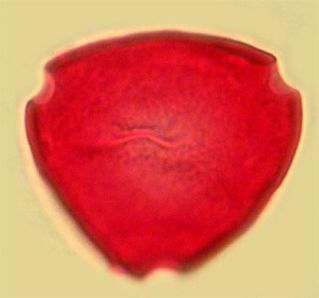 Botanists use living pollen and spores (actuopalynology) in the study of plant relationships and evolution, while geologists (palynologists) may use fossil pollen and spores (paleopalynology) to study past environments, stratigraphy (the analysis of strata or layered rock) historical geology and paleontology. The oil industry is credited with demonstrating the usefulness of palynomorphs in the study of stratigraphic sequences of rocks and the potential for oil and gas exploration. Because palynomorphs are resistant to decomposition and are produced in great abundance, their recovery from rocks and sediments via special and careful chemical treatments is possible and provides scientists with information needed to describe plant life of past ages. By describing the sequence of selected palynomorphs through the rock layers of Earth, stratigraphers (scientists who study the rock layers of the earth) are able to correlate rocks of the same age and may therefore locate and correlate layers that contain oil or natural gas. Palynomorphs recovered from the gut or intestinal tract of early humans, and those associated with artifacts (pots, tools, or other cultural objects) found at their grave sites have been used to understand the diets and hunting practices of these early people. For instance, the pollen and spores found in the feces recovered from the mummies of humans living seven thousand years ago, allowed scientists to describe the changes in diets through several generations of native people in northern Chile. Melissopalynology is the study of pollen in honey, with the purpose of identifying the source plants used by bees in the production of honey. This is important to honey producers because honey produced by pollen and nectar from certain plants as mesquite, buckwheat, tupelo or citrus trees demand a higher price on the market than that produced by other plant sources. Some plants may produce nectar and pollen that is harmful to human health. A careful monitoring of the pollen types found in honey may identify these toxic sources and the honey produced may be kept out of the commercial market. Palynology is a useful tool in many applications, including a survey of atmospheric pollen and spore production and dispersal (aerobiology), in the study of human allergies, the archaeological excavation of shipwrecks, and detailed analysis of animal diets. Entomopalynology is the study of pollen found on the body or in the gut of insects. It is useful for determining insect feeding and migratory habits, especially as it involves economically important insects (as the boll weevil, or earwigs). Forensic palynology, or the use of pollen analysis in the solving of crimes, is used by Crime Scene Investigators around the world. Bryant, V.M. Jr. and S.A. Hall. 1993. Archaeological palynology in the United States: a critique. American Antiquity, volume 58, pages 416-421. Jarzen, D.M. and McAllister, D.E. 1994. Eco-services: l. Pollination – love in the plant world benefits the whole world. Wildflower, North America’s Magazine of Wild Flora, volume 10, number 3, pages 24-27. Jarzen, D.M. & Nichols, D.J. 1996. Chapter 9 Pollen. In: Jansonius, J. & McGregor, D.C. (eds.) Palynology: principles and applications. American Association of Stratigraphic Palynologists Foundation, volume 1, pages 261-291. The Palynology collections at the Florida Museum of Natural History are many and diverse. The collection was started in earnest in 1997 with the hiring of D.M. Jarzen on staff as Collection Manager for the Paleobotany and Palynology section. The various components of the collection are itemized below. The John F. Grayson Library: Received as a donation to D.M. Jarzen through the courtesy of the Canadian Museum of Nature, Ottawa, Canada, the library consists of about 10,000 reprints, books, maps, and other materials associated with the career of John Grayson (Pan American Petroleum Corporation, Tulsa, OK). Since the establishment of the Grayson Library, other palynologists have donated part or all of their collections to the Florida Museum. These include the Dan Beju Library of mostly dinoflagellate papers numbering about 800, The Evan Kidson Library, S.A.J. Pocock Photographic Collection and the Don Engelhardt Library of more than 6,000 entries of papers, reprints, books and reports. The Modern Pollen Reference Collection includes 7,500 prepared slides of pollen and spores of primarily tropical regions of the world, used as reference material in palynologic analysis of Paleogene, Neogene and younger fossil assemblages. Included, is a fine collection of 600, Orchidaceae pollinia received as a donation from Dr. Pamela Burns Balogh. The Florida Museum Modern Pollen Reference Collection stands as one of the 5 largest collections of reference pollen material. Other additions to the pollen and spore reference collection include donations from Satish Srivastava, David Dilcher, Paul & Hazel Delcourt, Al Loeblich, Warren Drugg, Gretchen Jones, Vaughn Bryant and David & Susan Jarzen. Fossil Localities: Collections of prepared slides and unprocessed samples from fossil localities add to the value of the palynology collections. These collections include material from Paleozoic, Mesozoic and Cenozoic age rocks, as well as recent material from lake sediments in Florida and the Caribbean. Much of the prepared material is preserved on microscope slides and scanning electron microscope stubs. Geographically the material covers all continental lands and oceanic regions. Most of this material has been donated to the Florida Museum by D.M. Jarzen, with other collections received from D.L. Dilcher, S. Srivastava, S.R. Manchester, and John F. Grayson. Photographic Collection: A modest collection of about 4,500, 35mm, color transparencies of localities, pollen and spore forms, and other items accompanies the palynology collections. These slides have been donated to the Florida Museum by D.M. Jarzen. The photographic collection is being digitized to increase its utility. Use of the collections may be made by contacting Hongshan Wang, Collection Manager, Paleobotany and Palynology.